The first person she meets on the road is Lucas, whose been tied to a cross, covered in straw and left to the mercy of the crows. Lucas has no memory of how he got there or even his own name, so it's Dorothy who gives him the name Lucas, after the small town in Kansas that she comes from. The man with no past and no history is of course going to be complicated and Emerald City does not wait long to reveal this. The attraction between these two simply leaps off the screen. The two run into the first problem when the Mistress of the Eastern Wood, who it appears isn't quite so dead makes an appearance. The witch is quick to trap Dorothy and Lucas, in the Wizard's jail as she searches through Dorothy's meager possessions, determined to learn all she can about her. Dorothy, being from Kansas, of course has no answers which results in the Mistress of the Eastern Wood inflicting more pain. When the witch comes across the gun Dorothy took from the cop car, Dorothy tries to warn her that the weapon is dangerous, only to be told that, "only a witch can kill a witch". Seeing no way out, Dorothy instructs the witch to point the weapon at her head and pull the trigger. This time when the witch dies, she stays dead. In Emerald City, the Wicked Witch of the West screams at the exact moment her sister dies. Freed from the Mistress of the Eastern Wood, Lucas and Dorothy continue with their journey. Lucas tries to hide his injury from Dorothy but eventually, he gets to the point where he can go no further and so they are forced to seek out an apothecary. They find Mombi, who initially isn't very interested in helping but then she spies Lucas's sword and changes her mind. Lucas may not know who he is but it seems that Mombi has some ideas. It turns out that Lucas is a part of the Wizard's guard which participated in the slaughter of innocents. Dorothy may find Lucas handsome ( and let's be honest, he's hot as hell) but now she has to worry about who she is travelling with. For her part, Mombi isn't exactly an innocent; she's been keeping Tip locked up in a room in her home against his wishes. Tip manages to slip a note under the door asking for help which is picked up by Dorothy. Mombi tries to explain that though she isn't Tip's mother, she is protecting Tip from the world outside and that everything she does is for Tip. Mombi and Dorothy leave the matter unsettled, until Mombi gets it into her head to poison Lucas. Dorothy quickly gives Lucas charcoal and water to drink to absorb the poison, once again saving Lucas's life. At this point, Dorothy has had enough and so she takes Lucas's sword and uses it to lock Mombi in her room and then frees Tip, who runs off into the woods. In Emerald City, the witches set about with the funeral plans for their sister. Glinda is not at all impressed when The Wicked Witch of the West shows up higher than a kite. To make matters worse, The Wizard has ordered that the ceremony be open to the public. Clearly, this is meant to disabuse the people of their openness towards the witches. The sisters begin to chant and despite being high, West manages to collect all of her sisters spells, unfortunately however, this results in an explosion. The Wizard is quick to send Glinda back to the North telling her that the people won't be sad by her leaving. Mombi uses magic to free herself from her confines which leads me to wonder if she's actually Mother South and not some peasant hiding away. I don't think that we've seen the last of her. Tip spends the night in the forest with his friend Jack under the light of not one but two moons. The next morning, Jack awakes to find Tip missing. In the distance Jack sees someone wearing Tip's jacket and when he approaches, he finds a young woman. It seems that over the course of the night, Tip changed from male to female. Does this mean we have a trans* character? There's a lot to like about Emerald City. It has a WOC protagonist and potentially a trans* or at the very least a gender variant character. Vincent D'Onofrio as the Wizard is about as perfect casting as you're going to get. For now, the female characters are under the control of the Wizard; however, it's clear that Dorothy is the up coming storm and things are going to change. 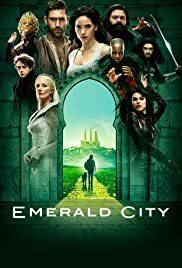 I'm not normally a fan of these types of adaptations and completely expected Emerald City to fail but it caught my imagination right from the get go. A darker Oz may not necessarily be appropriate for children but to me, it brings new life to an old story. I guess we will just have to follow the opium pollen yellow brick road and see where it leads us.